Conductor RAFFAELE PONTI is an artist of dynamic personality, charismatic performances, and superb musicianship. Ponti's trademark is in the breadth of his vision, the clarity of his interpretation, and the rich beauty of his sound. The Chicago Courier News writes, "Maestro Ponti is a rising star, someone gaining international acclaim and attention. Ponti brings an exhilarating energy level to center stage. It's an electrifying swagger-empowering and enabling him to pull music from light to darkness and back again." 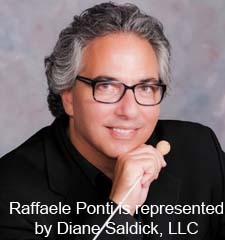 Currently Artistic Director and Conductor of the Paducah Symphony Orchestra in Kentucky and the Charlotte Symphony Orchestra in Florida, Raffaele continues to raise the artistic level of both orchestras and has developed extensive educational programs for people of all ages making the orchestras relevant to their communities. These programs include Maestro Visits; Musical Chairs; Behind the Notes; Music and Art; Young People's Concerts, Instrument Petting Zoo; Summer Music Camps, Youth Orchestras, and The Symphony as a Business Model. Ponti is an orchestra builder who has increased season tickets sales in Paducah by 65% and has achieved a completely sold out first season with the Charlotte Symphony, a first in the orchestra's history. He has attracted new patrons, sponsors, and businesses to his orchestras. Ponti has worked with world class artists Glenn Dicterow, David Kim, Ilya Kaler, David Halen, Michael Ludwig, Juana Zayas, Philippe Quint, Elena Urioste, Jeffrey Biegel, Robert Bonfiglio, Antonio Pompa-Baldi, Marvin Stamm, Allen Vizzutti, Ettore Nova, Ambra Vespasiani. Paola Romano, Vittorio Grigolo, Maurizio Graziani, Stefano Algieri, Mariana Paunova, Silvja dalla Benetta, Wilfredo Deglans, George Petean, Claudia Marchi, Salvador Carbo', Tatiana Lisnic, Carlos Almaguer, Patrizia Cigna, Michela Sburlati, Galina Kalinina, Mina Tasca, Stanislas Arraez, Alessandro Busi, Mauro Augustini. Recently Raffaele led the Buffalo Philharmonic and Erie Philharmonic with immediate return engagements, and made his debut as Music Director of the Charlotte Symphony (FL). In addition Raffaele is former Principal Conductor and Music Director, now Regular Guest Conductor of Italia Konzert Opera International in San Gimignano, Italy, Founding Director of Festival di Musica da Camera in Ripatransone, Italy, and continues to appear with prominent orchestras around the United States and Europe including the Buffalo Philharmonic, Erie Philharmonic, Rochester Philharmonic, Paducah Symphony, Charlotte Symphony, Genesee Symphony, Sofia Symphony, Varna State Opera, Orchestra di Pescara, Austin Symphony, Siena Symphony, Binghamton Philharmonic, Elgin Symphony, Teatro Lirico d'Europe, Billings Symphony, Italia Konzert Opera, Utica Symphony, Schenectady Symphony, Orchestra of the Southern Finger Lakes, and Syracuse Symphony. Raffaele's dynamic personality with excellent people skills makes him a favorite with everyone, orchestra, audience, board members, and sponsors.